"The word Rendanheyi has been invented by the Haier Group [the world's largest white goods company] and there is no exact English translation, but it can be loosely understood as 'integration of people and goals'," says Middlesex University Professor of CSR and Strategic Management George Frynas, who has just returned from a visit to the company's Qingdao HQ. It's a concept that has led to the re-organisation of the firm's entire corporate structure into a network of independent micro-enterprises called xiaowei qiye (abbreviated as xiaowei). The owner-CEO of a xiaowei (typically six to eight members) has a small ownership stake and operates as an entrepreneur with autonomous decision-making, including all contracting, budgeting and recruitment decisions. "The idea is that these xiaowei will help the company to become even more innovative and responsive to customers," Professor Frynas explains. "The Haier Group kept reinventing itself over three decades and now it is trying to transform itself from a conventional hierarchical manufacturing firm to an online-based entrepreneurial company with 'zero distance to the customer'." The Rendanheyi practice has been influenced by some Western ideas such as using key performance indicators and a flat organisational structure, but it also has important Chinese features. 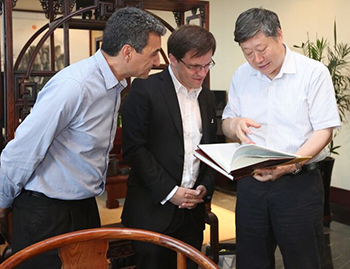 Haier Group CEO Zhang Ruimin, the man behind Rendanheyi, told Professor Frynas during his visit [pictured above with Professor Kamel Mellahi, left] that a Chinese holistic view of the world "is more efficient in the internet age" and hence supported Rendanheyi's creation. Rendanheyi's development is also consistent with the stronger emphasis placed on learning and a long-term focus in China (it took almost ten years to slowly develop the practice), as opposed to the Western tendency to seek immediate payoffs. Although Western attempts to understand innovative Chinese management practices such as Rendanheyi are in an embryonic stage, Professor Frynas says that they could come to influence Western ways of doing business. "Rendanheyi has the potential to enrich contemporary management theory and practice," he predicts. As well as innovative corporate structures, Haier are also paving the way when it comes to product customisation. The company's fully robot-operated washing machine factory in Qingdao can produce around dozen different models per day in production runs of less than 1,000 units. "Until now, I have been teaching my students that companies have to make a crucial choice between global standardisation and local customisation because of the costs involved in developing and manufacturing new products and other costs, but the developments at Haier point towards the future of customisation, which could reshape manufacturing in coming decades," Professor Frynas explains. Examples of Haier's responsiveness to customer needs include a washing machine for vegetables. After discovering that some Chinese farmers were using washing machines for cleaning sweet potatoes, Haier reacted by designing a more robust model that can cope with additional grime and soil. Most recently, the firm designed a very small washing machine for children's clothes that caters to small families. For Professor Frynas, it all comes back to recognising the value of diversity. "Diversity leads to new ideas," he says. "Innovative companies like Haier in the East and Google in the West understand this. "These companies shape environments where very different people can collaborate within the company in small teams. Likewise, innovative companies pay attention to the diversity of customers, so that their products and services can be tailored to meet a diversity of needs. Recognising diversity helps companies like Haier to continue innovating."